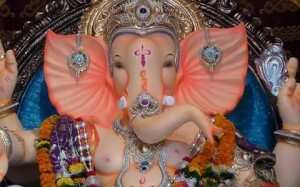 Pictures of the Best and Most Famous Ganesh Idols and Mandals in Mumbai in 2012. Ganesh Chaturthi started on 19 September, 2012 and Ganpati Murti “Visarjan” (Immersion) was on Anant Chaturdashi on 29 Sept.
Visit this link for – Pictures of the Best Mumbai Ganesh Idols (Murty) in 2013. Visit this link for – Pictures of Famous and Best Mumbai Ganpati Idols in 2014. Visit this link for – Mumbai Ganpati Photos and Ganesh Chaturthi in 2015. Visit this link for – Mumbai Ganesh Photos and Mumbai Ganesh Chaturthi in 2016. Best Ganpati Idol Khetwadi 12th Lane, Girgaum. Idol designed by Raju Shinde. 2nd Runner Up Best Ganpati Mandal Khetwadi 12th Lane, Girgaum. Mandal based on ISKCON temple. Art director dilip Dada. The Khetwadi 12 Galli Ganraj Ganesh Pandal is fit for a special king and it was declared “THE BEST GANPATI IDOL” and “2nd RUNNER-UP BEST GANPATI MANDAL” in Mumbai in 2012 by the Times of India. Based on the ISKCON temple, Ganraj Ganpati sits on a throne with peacocks. The Khetwadi 12th Gali Ganraj Moorti was designed by Raju Shinde. The Pandal was based on the famous “Laxmi Niwas” palace in Bikaner and was designed by art director Anand Sawant. The organizers of the 12th Lane Khetwadi Mandal are “Sarvajanik Ganesh Mandal”, Girgaum.The Khetwadi Ganraj is located near Girgaum, Chowpatty and has been around since 1959. The Fort Vibhag Sarvajanik Ganeshotsav Mandal’s Ganesh Idol is called “Fortcha Icchapurti Ganesh“. In 2012, the Fort Ichapurti Mandal / Pandal was voted the “BEST GANESH MANDAL IN MUMBAI“. The stunning pandal was modelled after the beautiful Laxmi Niwas Palace in Bikaner in Rajasthan. Hindi movie art director Anand Sawant designed this elegant and stunning Ganesh Pandal. The Fort Icchapurti Ganpati Murti (Idol) was made by Vijay Khatu. This year, the devotees of the Fort Mandal have taken up the cause of Organ Donation and have created awareness via their Mandal. In 2012, the distinctive GSB Seva Ganesha Idol was voted “1st RUNNER-UP BEST GANAPATI IDOL” in Mumbai by Times group. The 2012 GSB Seva Mandal Ganesha sparkles with gold ornaments. The throne of this royal Ganpati is made of over 250 kgs of Silver. This Mumbai’s richest Ganesh Mandal. The GSB Seva Mandal Ganesh will be on most people’s top 10 list of best Mumbai Ganesh idols of 2012. Started in 1928, the famous Ganesh Galli Ganpati Idol is called “MUMBAICHA RAJA“. The organizers are “Lalbaug Sarvajanik Utsav Mandal“. A large Golden Hand adorns the idols right hand. The Ganesh Galli Pandal is inspired by the famous “Pashupathinath Temple” in Nepal. “Lalbaugcha Raja” is among Mumbai’s most famous and respected Ganesh Idols. In 2012, the Lalbaghcha Raja was the “MOST VISITED GANESH IDOL” in Mumbai. Worshipers coming to Lalbaghcha Raja have a strong belief that their wishes will be fullfilled; hence the Lalbaug Ganpati is also called “Mannatcha Raja“. 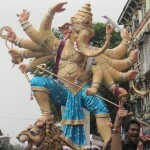 Situated in Bombay’s Lalbaug, the organizers are “Lalbaugcha Raja Sarvajanik Ganeshotsav Mandal”. Spectacular Ganapati with 10 hands striding a lion. Certainly among the best Mumbai Ganesh Idols of 2012. Even other lane in Khetwadi has an amazing Ganpati. It’s a great place to celebrate Ganesh Chaturthi. 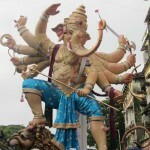 The 2012 andheri Teli Galli Ganesh Idol is an unique statue. Tall, imposing and with Wheatish skin color, the Tali Gali Ganpati stands out. 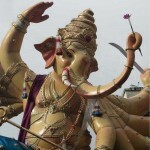 The tall 2012 Ganesh Idol at Nare Park in Parel, Mumbai is popularly called “PARELCHA RAJA“. This statue was designed by Vijay Khatu. The Chinchpokli Ganesh in Central Mumbai is popularly called “CHINCHPOKLICHA CHINTAMANI“. “Chintamani” eradicates worries and tension. The Borivali Ganpati idol in North Mumbai is popularly called “UPNAGARCHA RAJA“. “Upnagar Cha Raja” means “King of the Suburbs”. The Borivali Mandal has among the best decorated Ganesh Pandals in Mumbai in 2012. Mumbai Ganesh Photos and Mumbai Ganesh Chaturthi in 2016. Mumbai Ganpati Photos and Ganesh Chaturthi in 2015. Pictures of the Best Ganesh Idols in Mumbai in 2013.